Blair & Ryan Duffy, Mrs. & Mr. Nubian Napata Maui – 2011, come to NPS with a vast amount of formal education and world travel performing community service. Ryan hails from NYC and Blair from Arlington, Virginia. With dedication and conviction they achieved college degrees, Blair with hers in Theatre from Ursinus College (PA) and Ryan’s in English Literature from Fordham University (NYC). Blair performed, produced and created productions while in college. Subsequent to college experience, her heart led direction towards various community service projects, such as working with the elderly & reading to the youth and conviction to a group called Wayfinder which worked directly with youth to develop appropriate life & social skills. Ryan also leveraged his efforts towards local community service projects along with efforts towards the Bronx African American History Project (BAAHP) that which was designed to record an oral history of the Borough of the Bronx (NYC). Astounding as it may seem these two young role models traveled and lived in several countries outside the USA to serve local communities in such ways that only few are able. It was the foundation (values) of their upbringing that prepared them to serve as role models, which also comprised deep conviction, desire and experience of working with all ethnic groups within their respective local communities. With this background and wherever their travels led them, the value of always giving back to communities less fortunate became their mindset. Ryan’s travel led him to Prague, (The Czech Republic) where he learned the Czech Language and lived its culture. Equally important was Blair’s travel to Antarctica. Needless to say, Ryan & Blair met through community service work and subsequently an opportunity to visit Thailand together engaged them to learn its language, Thais. They spent over a year in Thailand teaching English, working with autistic children, helping them cope with their disorder, teaching theatre (Drama) to children to build confidence and leadership skills through performance & social games. 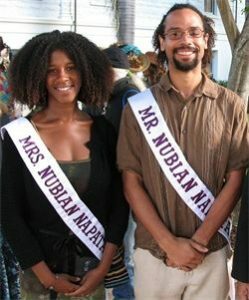 Blair & Ryan returned to the USA and arrived in Maui in 2009 and immediately showed their flexibility to adapt to Hawaii, Maui Style, showing their entrepreneurial skills and again, their interest in community service, and now hold the titles of Mr. & Mrs. Nubian Napata Maui – 2011.